Chinese orbital launch vehicle. The 540/HO configuration for the Long March New Generation Launch Vehicle series would use the 5.0 m core stage, topped by the 5.0 m upper stage, together with 4 x 2.25 m strap-on stages. First flight of this version was expected after 2010. Payload was given as 6 metric tons to geosynchronous transfer orbit. This version was no longer mentioned when by 2016. 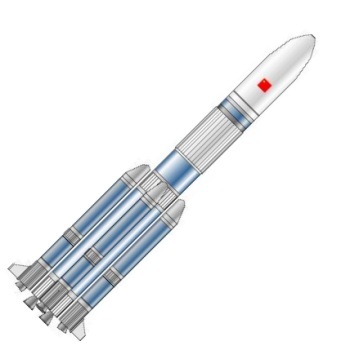 AKA: Chang Zheng Next Generation Launch Vehicle Type C;CZ-5-5.0;CZ-NGLV-C;Long March Next Generation Launch Vehicle Type C. Status: In development. Payload: 6,000 kg (13,200 lb). Thrust: 5,840.00 kN (1,312,880 lbf). Gross mass: 490,000 kg (1,080,000 lb). Height: 53.00 m (173.00 ft). Diameter: 5.00 m (16.40 ft). Span: 11.00 m (36.00 ft). Payload: 6,000 kg (13,200 lb) to a GTO. Stage 1. 4 x CZ-NGLV-200. Gross Mass: 69,000 kg (152,000 lb). Empty Mass: 6,000 kg (13,200 lb). Thrust (vac): 1,340.170 kN (301,282 lbf). Isp: 336 sec. Burn time: 150 sec. Isp(sl): 301 sec. Diameter: 2.25 m (7.38 ft). Span: 4.60 m (15.00 ft). Length: 25.00 m (82.00 ft). Propellants: Lox/Kerosene. No Engines: 1. Engine: YF-120t. Status: Development 2004. From top to bottom the 2.25-m Chinese new generation launch vehicle consists of a 42.3 cubic meter liquid oxygen tank, an intertank section, a 22.0 cubic meter kerosene tank, and an engine section with one gimbaled LOX /Kerosene engines of 1200 kN vacuum thrust. The oxygen tank is pressurized using oxygen bled from the engine and helium is used to pressurize the kerosene tank. The engines can be throttled to 65% of rated thrust. Burn time shown assumes full thrust during engine burn. Stage 2. 1 x CZ-NGLV-500. Gross Mass: 175,000 kg (385,000 lb). Empty Mass: 17,000 kg (37,000 lb). Thrust (vac): 1,399.990 kN (314,730 lbf). Isp: 432 sec. Burn time: 480 sec. Isp(sl): 333 sec. Diameter: 5.00 m (16.40 ft). Span: 5.00 m (16.40 ft). Length: 31.00 m (101.00 ft). Propellants: Lox/LH2. No Engines: 2. Engine: YF-50t. Status: Development 2004. From top to bottom the 5-m Chinese new generation launch vehicle consists of a 117.3 cubic meter liquid oxygen tank, an intertank section, a 350.7 cubic meter liquid hydrogen tank, and an engine section with two gimbaled LOX /LH2 engines of 660 kN vacuum thrust each. The hydrogen tank is pressurized using hydrogen bled from the engine and helium is used to pressurize the oxygen tank. Stage 3. 1 x CZ-NGLV-HO. Gross Mass: 26,000 kg (57,000 lb). Empty Mass: 3,100 kg (6,800 lb). Thrust (vac): 156.000 kN (35,070 lbf). Isp: 448 sec. Burn time: 600 sec. Diameter: 3.35 m (10.99 ft). Span: 5.00 m (16.40 ft). Length: 12.00 m (39.00 ft). Propellants: Lox/LH2. No Engines: 2. Engine: YF-75. Status: Development 2004. The upper stage for the Chinese Next Generation Launch Vehicle is a modification of the CZ-3B upper stage. The stage uses a version of the Lox/LH2 YF-75 engine, simplified for improved reliability. The stage is of hammerhead form, with the upper LH2 tank with a diameter of 5 m, and the lower liquid oxygen tank with a diameter of 3.35 m. The total propellant is 22,900 kg with a burn time of over 600 seconds. Empty mass has not yet been released and is estimated. Family: orbital launch vehicle. Country: China. Engines: YF-100, YF-77, YF-75D. Stages: CZ-NGLV-500, CZ-NGLV-200 stage, CZ-NGLV-HO. Agency: CALT.